Interesting piers for boats and yachts. Here is an overview of some attractive piers offering special attractions or shopping facilities for your trip. If you do not sail onwards in the direction of Templin but, instead, further up the Havel, you will reach the self-service watergates Schorfheide and Zaaren. At the Regow lock you can visit the goat cheese factory "Capriolenhof". The next watergate along this route is Bredereiche. On it goes in the direction of lake Stolpsee. Here you can land at Himmelpfort: Stolpesee boat house (phone +49-(0)33089-43022) with marine fishing, fish restaurant, fish diner, fish-selling. Furthermore, you can visit the ruins of the former Cistercian monastery. Those who are full of good hope can submit their Christmas wish list at the Christmas post office (which has been established due to the town's name: Himmelpfort(e) = gates of heaven). After the Himmelpfort lock you sail on the feeder river Woblitz to lake "Grosser Lychensee" (great lake of Lychen). This wonderfully beautiful stretch leads through wide forests with beeches and alders. After this, you should definitely moor at Lychen townlake jetty (phone +49-(0)160-6506586). The town of Lychen lies like an island between seven lakes. Only two of those lakes are open for motorboating: 'Grosser Lychensee' and 'Stadtsee' (townlake) where you can also land. Attractions worth seeing are the log driving museum and the remainders of the historical town wall. Coming from Himmelpfort, you can also set a course directly across lake Stolpsee for Fürstenberg. 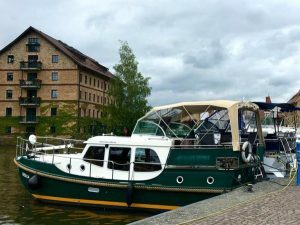 You can conveniently moor at the "Yachtclub Fürstenberg" ot at the marina of Fürstenberg. Here will also find good shopping facilities. The tourist information offers guided city walks or a visit at the "Brandenburgisches Forstmuseum" (Brandenburg forestry museum). In Fürstenberg there is also the concentration camp memorial site Ravensbrück. Neatly kept hotel complex including public swimming bath with waterslide. When approaching thorugh the "Kammerkanal" canal, please pay attention to the height of the railway bridge (3.50 m). The City port of Neustrelitz (with a very nice Café in the storehouse) is a good starting point for an exploration of the environment. Not far away are the historical town centre and the castle garden where attractive open-air events are taking place in summer. Worth seeing: the thatched boat houses and the castle complex. Attention: Do not take shortcuts during your trip, always stick with the buoyage, the water gets very shallow and stony! In Röbel you can enjoy a Müritz thermal bath with waterslide, or climb the tower of Saint Marien church. The tourist information and an exhibition of the town history are located in the "Haus des Gastes" (house of the guest). Largest Himalaya crystal salt cave in Mecklenburg-Vorpommern. Moor at city port Waren (phone +49-(0)3991-666754). Waren is a small town with many tourists visiting, a historic district worth seeing, the Müritz museum, varied gastronomy and a lot of shopping facilities. Guests interested in the history of this place might want to visit the old swingbridge, the monastery complex, the GDR museum and the organ museum. In the beertown Lübz it is recommendable to take an extensive tour of the brewery and, better before that, to visit the planetarium and the lift bridge. You can be berthed very calmly in a small, idyllic city port. The medieval townscape is characterized by half-timber houses and plastered streets. Worth seeing are the brick churches Saint Marien and Saint Georgen. The town castle is something to be seen. Also the adorable gardens between the historic district and the lakes. Being a larger town, Schwerin offers good shopping facilities.